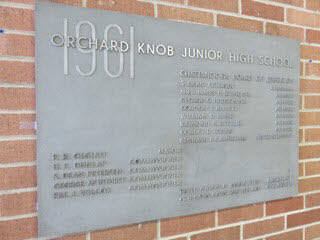 The Orchard Knob Middle School band got a sound ‘check’ of a different kind Monday morning. While in Chattanooga for the Krystal restaurant chain’s corporate-wide convention running through Wednesday at the downtown Marriott/Trade Center, new company CEO Paul Macaluso presented the school a check for $3,000 to help buy and repair instruments. 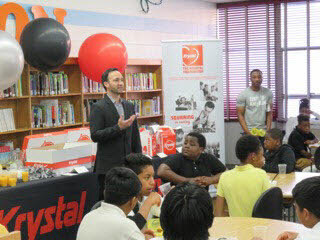 During an 8 a.m. presentation inside the library of the school off North Highland Park Avenue, he briefly turned into teacher and used Krystal as an example to the several dozen students and staff gathered of how dreams can come true. 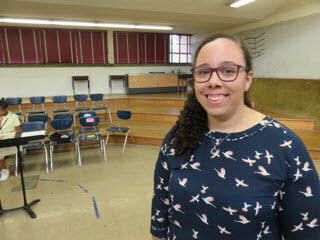 Among those who have been dreaming is first-year Orchard Knob band director and teacher Annece Holts. 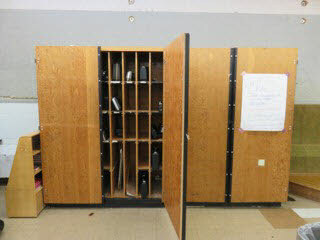 When she arrived this year after teaching at two elementary schools in Knox County, she realized that many of the school’s instruments did not work, and she also had to borrow additional instruments from a Signal Mountain school. In fact, putting together instruments was much more on her mind than the usual first step of putting together pieces of music. Among the band students already excited were flute player Patience Freeman and alto saxophone player Skylar Johnson. 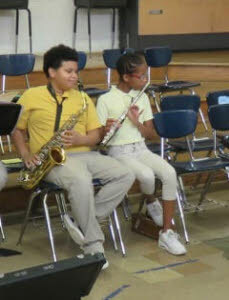 Patience said one of her keys on her flute does not work, while Skylar added that he can’t play low on his sax because a piece where the instrument is broken keeps poking him. “I feel like it will give me a better opportunity to play my instrument more,” he said after hearing about the donation. The money for the check for the musical instruments and equipment upgrade came from Krystal’s two-year-old Krystal Foundation. Mr. Macaluso said before the ceremony that the check is an example of efforts by the company to help in areas where it operates restaurants. Besides the arts, the foundation also tries to help in the areas of science, technology, engineering and math. 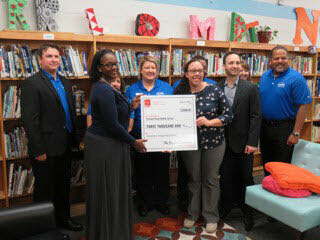 Checks are also being presented to two Cleveland schools – Cleveland Middle and George Stuart Elementary – for technology-related programs. 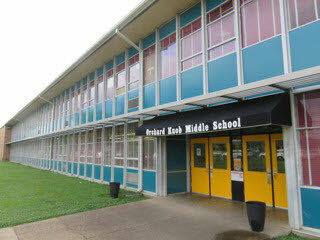 Regarding Orchard Knob, teacher Ms. Holts said that the school has had a band off and on, and her goal is to have a regular pep band to play at the school’s football and basketball games. She has a little experience with bands, as she once played for the most famous school band in the state – the University of Tennessee’s Pride of the Southland Band – after playing in the band at South Fork High School in Stuart, Fla.
She had meticulously filled out the grant application, and that had resulted in the joining of the sax and other instruments with the sacks full of Krystal food and drinks also handed out at the school Monday along with Krystal coupons. 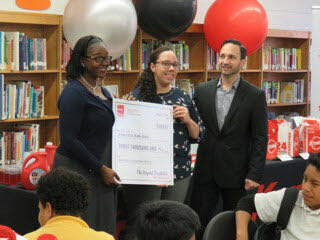 “She poured her heart into the application process,” said Mr. Macaluso during the presentation. Mr. Macaluso is also from Florida originally and said in the brief interview before speaking that he enjoyed Krystal food as a child in the central part of the state. He said the company also loves its Chattanooga heritage, and that was one reason they wanted to have their meeting here, even though the corporate headquarters are now in Atlanta. He also said that the chain is coming out with a new retro-inspired modern look, and the style is being called the Davenport in honor of company co-founder R.B. Davenport and the Davenport family’s long connection to the chain. The first restaurant with this look is scheduled to open in late July in Jackson, Miss., he said. He added that the convention is drawing both corporate and system-wide employees and franchisees. “We are recognizing each other and building our plans for the brand moving forward,” he said.